Gates of Lodore Trips Almost Sold Out! The Gates of Lodore on The Green River is one of the most popular trips and 2013 is no exception. We have sold out of two of our dates and only have two dates left. Our last two launches on June 15th and August 4th only have 10 spots left! Don’t miss this journey into the spectacular wilderness of Dinosaur National Monument . The Gates of Lodore trip has lots of activities and action. You can choose between paddling with friends in a paddleboat, taking on the rapids with one of our inflatable kayaks or relaxing in one of the oarboats. 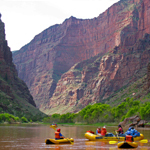 Tags: Gates of Lodore, Green River rafting, Family River Trips, Dinosaur National Monument, Rafting Trips in Utah.